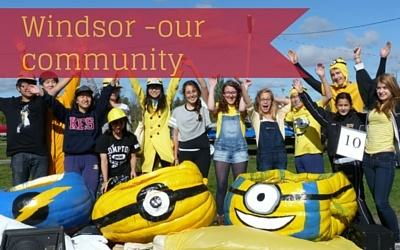 Thanks to a great core of student volunteers which included pumpkin carvers, artists, parade goers and pumpkin paddlers, KES had a successful weekend taking part in the Town of Windsor Pumpkin Regatta and the Children’s Wish Foundation Parade of Paddlers. Preparing for the event is quite the process! Thank you to the many 'hands-on-deck' for scooping hundreds of pounds of pumpkin out of the giant vessels so our boats were lighter weight and easier to manoeuver on race day. The original weight of the KES pumpkins was between 600 and 1100 pounds! Keeping with this year’s theme of “Shrek”, an awesome team of artists helped to paint each pumpkin, design the float and pull together costumes. The conditions for the pumpkin regatta were windy and brisk, and the shores of Lake Pisiquid were jam packed with thousands of spectators. Some boats did not make it to the start line, as their giant gourds were swamped or they were not able to balance and then tipped. All KES boats started and finished the race and looked strong from beginning to end! Aden O’Callaghan (who paddled the race with a hole in his boat, which coincidentally was called “The Ogre’s Swamp”) finished in a time of 18 minutes for 21st place overall. The doubles team of Harrison Klein and Silas Fillmore finished the race in a time of 22.41 for 10th place in their category, and Mya Snarr and Lindsay Hogan had a time of 23.26th for a 12th place finish. It was a spectacular day for the community and KES students, and truly a “unique to Windsor, Nova Scotia” event! Our hometown is the perfect location for you to go to school. It is a safe community that is alive with many recreation activities for all seasons.